Pearl stretch bead bracelets. 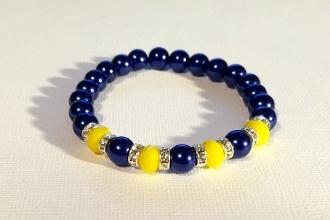 Available in Navy Pride design with navy blue pearl and yellow beads with Sharkoski crystals, Red Friday design with red pearl beads with Sharkoski crystals, and American Pride design with red, white, and blue pearl beads with Sharkoski crystals. It is available in 6.5", 7", 7.5 ", 8" and 8.5 inch. It is a stretch bracelet and should fit just a little loose so take that into consideration when placing the order. If you don't know your size measure you wrist with a piece of paper or ribbon and then use a ruller to get the measurement from that. There is a discount of you order 2 or more of these bracelets. This item has FREE Shipping!